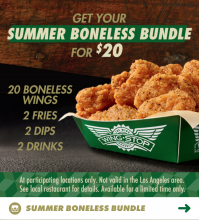 20 Boneless Wings, 2 Fries, 2 Dips, and 2 Drinks for $20. Not valid in LA. At participating locations.